Three years ago, I undertook to convince you to watch Ozu Yasujirō’s movies because of five solid reasons: realism on the screen, the opportunity to hear/read spoken Japanese (dialects), excellent actors, the Japaneseness and the stylised, interactive way of filming. 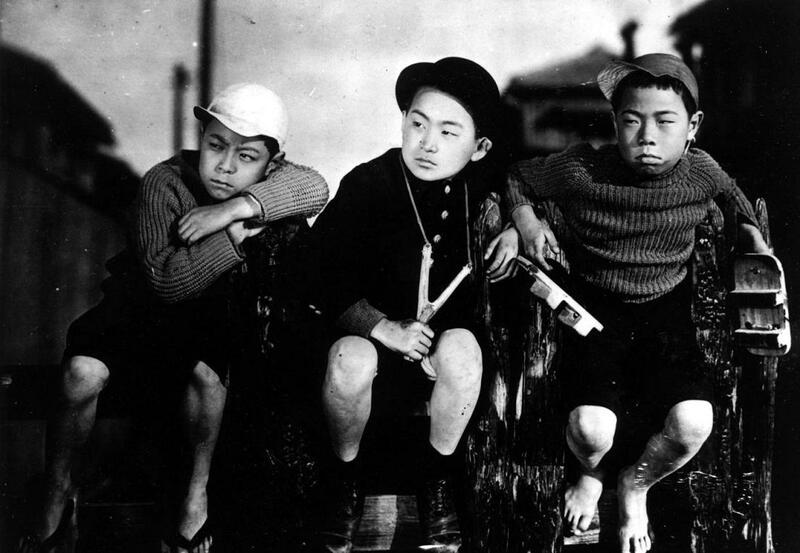 I was again impressed by all of these things characterizing director Ozu’s style after watching the silent movie “Gosses de Tokyo” (original title: 大人の見る絵本　生れてはみたけれど otona no miru ehon – umarete ha mita keredo “A picture book seen by adults – I was born, but …” 1932) at Film Fest Gent last week. This film festival showed a selection of Japanese movies as a tribute to the 150 years of friendship between Japan and Belgium (I wrote something about this here!). 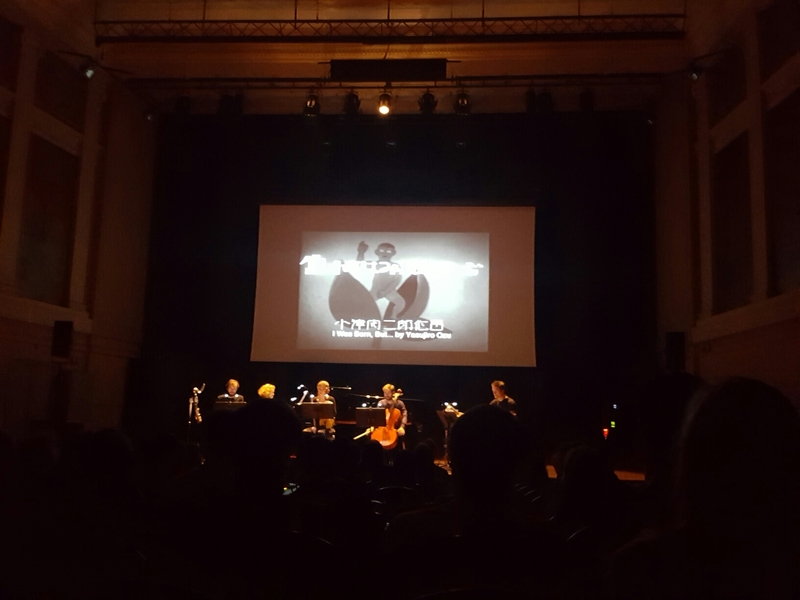 The screening was accompanied by beautiful live music, a new score written by Gwenaël Grisi and brought by a quintet. Dad: Did you enjoy going to school today? Son: Yeah, going was fun and coming back was fun too, it was only the part in between that was really boring. Other comical elements were the boys’ behavior, in which we all resemble ourselves as a child, and the younger brother constantly mimicking the older one. Because it was a silent movie, language use was limited and depended for a great deal on correctly interpreting the context. 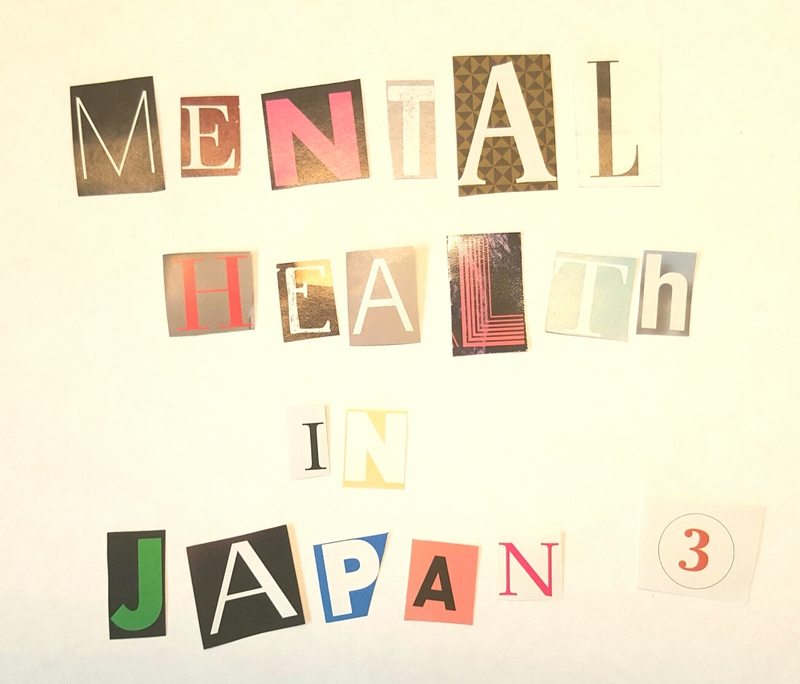 In some cases, it really helped having some insight in Japanese culture. For instance, there was a scene in which the boys, who had skipped school, asked the sake delivery boy to write the grade “A” (甲 kō) on a fabricated calligraphy homework. Unfortunately, the delivery boy drew the middle line so that it emerged on top, producing thus an entirely different character, 申 (saru, meaning among many other things, “monkey”). When one of the boys proudly presented this homework to his father, he wisely covered the upper part of his ‘grade’. Apart from such rare occasions, the visual story line spoke for itself and was nicely complemented by the music. Thanks to Jana for the invitation! After a few research-based posts, I felt like presenting a more visual topic this time. And what better eye candy is there besides some of Japan’s most beautiful and culturally inspired places? Hence my topic: The United Nations Educational, Scientific and Cultural Organization (UNESCO) World Heritage. In this post, I will show you which places in Japan have been granted a world heritage status since the Japanese acceptance of the convention in 1992. Because I visited some of these places myself, I hope to share a few of my own pictures here as well (all pictures are mine, unless mentioned otherwise). Currently, the list includes 16 cultural and 4 natural sites in Japan. Such criteria include, for example, being a representation of human creativity, an interchange of human values, a cultural tradition or a development in design, art or technology. Or, the site in question must be an outstanding example of technology, landscape or architecture that plays a significant role in human history and culture. Natural world heritage, on the other hand, should represent outstanding natural phenomena, significant biological and geological processes or the major stages in the history of our earth. I can’t believe I couldn’t find a decent picture of the Horyū-ji temple 法隆寺 from when I visited Nara. The main hall, entrance gate and pagoda date back to the early seventh century and are among the world’s oldest wooden buildings. Himeji-jō 姫路城 is an excellent example of early Japanese castle architecture. It looks very sophisticated with its white walls and elegant rooftops. This fourteenth-century castle was remodeled and expanded in 1581 by the famous “unifier” Toyotomi Hideyoshi. The Temple of the Golden Pavilion (kinkaku-ji 金閣寺) is one of the most popular attraction in Kyoto. This gaudy piece of architecture was originally the villa of a rich statesman but was purchased by shogun Yoshimitsu and converted into a Zen Buddhist temple. In a novel of the same name by Mishima Yukio, an acolyte burns down the temple. This story was based on true events. Other famous historic monuments in Kyoto include the Kiyomizu-dera “clear water” temple 清水寺 founded in 778. You cannot see it on the picture above, but the temple is located on a hill and therefore supported by tall pillars on one side. Not a single nail was used in the construction of the temple. This famous stone garden is part of the Zen Buddhist Ryōan-ji temple (“Temple of the Dragon at Peace” 龍安寺). The placement of the stones is intended so that one is unable to see everything from one place. I thought Byōdō-in 平等院 in Uji was truly a magical place. Again, this building was originally a villa and later transformed into a Buddhist temple. The central Phoenix Hall is surrounded by a pond and appears to be floating due to its reflection in the water. This hall and the phoenix statue on top of it are depicted on the 10 yen coin and the 10,000 yen bill. I have never been to Toyama or Gifu but I would love to visit these traditional villages. Characteristic are the big houses with slanted roofs, an architectural style known as “prayer-hands construction” (gasshō-zukuri 合掌造り). Itsukushima 厳島, often called Miyajima (“shrine island” 宮島), is located not far away from the bay of Hiroshima. The key shrine on the island, Itsukushima Shrine, is particularly famous because its gate and main building are built in the sea. Looking at the picture above, you can see how far the water reaches at high tide, which gives the illusion of a floating gate. Also in Hiroshima you can find the Atomic Bomb Dome (genbaku dōmu 原爆ドーム) as part of the Hiroshima Peace Memorial Park. This ruin was originally the Prefectural Industrial Promotion Hall and is the only building near the hypocenter that survived the atomic bombing of August 6, 1945. Oh deer, we’re in Nara! This cutie was so kind to pose for us in front of the Tōdai-ji’s ( “Great Eastern Temple” 東大寺) Great Southern Gate (Nandaimon 南大門), reconstructed at the end of the 12th century since the original structure from the 8th century had been destroyed by a typhoon. On the gate is written “Daikegonji” (大華厳寺), an alternative name for the Tōdai-ji temple. The main “Big Buddha” hall (Daibutsuden 大仏殿) of the Tōdai-ji is an impressive construction of wood and houses an enormous bronze statue of a sitting Buddha (picture below). The 16 m high statue was completed in 751 and literally contained almost all of the bronze available in Japan at that time. Another destination on my Japan bucket list is Nikkō (日光) in Tochigi prefecture. Futarasan-jinja 二荒山神社, Rinnō-ji　輪王寺 and Nikkō Tōshō-gū　日光東照宮 were designated as UNESCO world heritage at the end of last century. On the picture you see the main hall of Nikkō Tōshō-gū, a Shintō shrine dedicated to Japan’s first shogun Tokugawa Ieyasu. The Ryūkyū kingdom (15th – 19h century) ruled over the islands south of the main island of Japan. The remains of many gusuku (“castle” in Ryukyuan) on Okinawa such as Shuri castle 首里城 in the picture above have been listed as world heritage. Fun fact: the gate of this castle is depicted on 2,000 yen bills. Read more about its history in my blog post Money Matters. I photographed this belfry on mount Kōya ( Kōyasan 高野山), the center of Shingon Buddhism. It belongs to the Garan (“temple” 伽藍), the main temple complex founded by Kūkai. Other sacred sites and pilgrimages include places in Yoshino, Omine and Kumano. Since I did not know about this place, I was curious about the story behind this silver mine in Ōda: apparently, during the 17th century, its output accounted for one-third of all the silver in the world! The mine was active for almost four centuries until its closure in 1923. The heritage site also includes three castles that protected the mine, ports for export, transportation routes and various other sites that bear an important connection to its history. The city of Hiraizumi 平泉 plays an important role in Japanese history as the home of the ruling Fujiwara clan during the Heian period. It developed quickly into a city of sophistication and splendor for 100 years, rivaling Kyoto as the place to be. As soon as the Fujiwara were overthrown, Hiraizumi became forgotten, but many buildings remain well-preserved even today. It is said that Hakusan Shrine 白山神社 (picture) was the structure first built in Hiraizumi in 717. This iconic view is so well-known that I should not need to expand further. Sakura, Fuji-san 富士山and shinkansen: Japanese scenery in a nutshell. I am, however, very much surprised that it took so long before Fuji Mountain was recognized as world heritage. This mill in Gunma prefecture is Japan’s oldest modern silk factory and still in its original state today. The government established the mill in 1872 as a model factory to industrialize modern machine silk reeling imported from France. A collection of more than 20 sites illustrate Japan’s rapid development as a modern and industrialized country in the Meiji period. An example is Thomas Glover’s house on a hill in Nagasaki, looking out over the city. Thomas Glover, a Scottish merchant, played a crucial role in the modernization of Japan by introducing Western technology. Besides many buildings in other places of the world, Le Corbusier designed the National Museum of Western Art in Tokyo. This museum is the only work of Le Corbusier situated in the Far East. The Shirakami mountains (Shirakami sanchi 白神山地) is an immense unspoilt forest situated in Akita and Aomori prefectures. The forest is highly protected and visitors without permission cannot enter the heritage site. Yakushima 屋久島 is an island located in the south of Kyūshū and is particularly famous for its ancient cedar forest. Some of the trees are more than thousand years old. Because of its subtropical climate and boundless rainfall, Yakushima also has plenty of waterfalls, such as Ōko no Taki you see in the picture above. Of course, the Northern island of Hokkaidō has some natural heritage material as well. In the Shiretoko National Park (Shiretoko kokuritsu kōen 知床国立公園) you can find wildlife such as bears, foxes and deer. During wintertime, drifting sea ice can be seen from there. The last world heritage site on our list is a chain of remote vulcanic islands known as the Ogasawara Islands 小笠原諸島, also called Bonin Islands. People live only on the two main islands, “father island” (Chichijima 父島) and “mother island” (Hahajima 母島). Next to beautiful beaches such as the Kominato beach and Kopepe beach, the Ogasawara Islands offer a warm climate, unexploited forests and a unique vegetation. Have you visited one of these places? Let me know! First of all, I must admit that I am not a huge haiku fan: I love reading poetry, but I prefer long poems, just like I usually read thick books. That being said, from time to time I enjoy browsing through some haiku collections. Last year I received the Dutch translation of Classic Haiku, a compilation of some of the most famous haiku categorized by master. Among these names, my favorite haiku writer is definitely Kobayashi Yatarō (1763-1828), known by his pen name Issa 一茶. Issa literally means “one (cup of) tea” and refers to the serenity of the Japanese tea tradition 茶道 (sadō) but also to the emptiness of life, as can be observed in the disappearing froth on a cup of matcha tea. Throughout this post, I will visually serve you five haiku by Issa and five types of Japanese tea. Enjoy! Issa wrote more than 20,000 haiku. His style is characterized by a simplicity and childish admiration for the outside world. “Lower” creatures such as flies, frogs, snails etc. are often the topic of his poems, in contrast to more traditional kigo 季語 (seasonal words) other famous haiku masters employ. Issa introduces the sentimentality and banality of everyday life into his poetry. Issa was not exactly a lucky man. When his mother died, he was forced by his “evil stepmother” to leave the house, his first two wives and all of his children died, and when he at last managed to secure a part of his family’s property, his house burnt down. Shortly after that, he died in the storehouse next to the house that had survived the fire. Despite his misery, Issa succeeds in capturing the beauty of nature with empathy for every living being. He also often mixes in personal feeling. Therefore, his poetry is considered to be more “humane”. Issa’s poetry is often humorous, and in many cases verging on satire. He uses a colloquial tone, plain language and sometimes local dialects. This results in very down-to-earth poetry that is accessible to all kinds of readers. Similar to Bashō a century before, Issa was the wandering type of poet. After having studied the art of haiku under Nirokuan Chikua in Edo, he became a Buddhist priest and travelled around Japan for about ten years. Apparently, Issa looked like a beggar, was extremely poor and lived off the earnings of others. His situation is reflected in humorous self-portraits and haiku mocking his own condition. He wrote from the perspective of people at the bottom of society and created a new poetic style that differed greatly from previous haiku masters. On hot days in Japan, everybody drinks chilled tea and I loved to check out new kinds of tea during my time spent there. My favorite cold tea is jūrokucha 十六茶, a mix of sixteen different teas (the more the better! ), followed by hōjicha ほうじ茶 (roasted green tea) and iced barley tea (mugicha 麦茶). The last one is offered for free in many shops. [List of Japanese teas here.] When it is hot in Belgium, I usually make lots of Oolong tea and put it in the fridge. So refreshing! Lowenstein, Tom, John Cleare, and Susanne Castermans-Nelleke. Klassieke haiku’s: de mooiste Japanse poëzie van Bashō, Buson, Issa, Shiki en hun navolgers. Kerkdriel: Librero, 2015. Ueda, Makoto, and Issa Kobayashi. Dew on the Grass: The Life and Poetry of Kobayashi Issa. Brill’s Japanese Studies Library, v. 20. Leiden ; Boston: Brill, 2004. All translations and pictures are mine. For the translations of the Japanese haiku I chose to stick to the 5-7-5 rule. Part of my tea collection: matcha, genmaicha, jasmine tea, Chinese milky oolong tea and sencha. Sakura-themed coffee I enjoyed earlier this spring in Japan. Japanese culture is often said to have a special connection with nature. Japanese aesthetics are therefore characterized by this “traditional love of nature”. It is true that Japanese people, young and old, participate in several festivals and annual observances celebrating the beauty of nature, such as viewing cherry blossoms in spring or admiring the bright foliage in fall. Daily life also reflects those seasonal associations: cooking, house decorations, clothing and even greetings are systematically adjusted to weather, fauna and flora. But do the Japanese really have an inherent affinity with nature, more than other people worldwide? For one of my classes at Kobe University, I read parts of Haruo Shirane’s book titled “Japan and the Culture of the Four Seasons: Nature, Literature, and the Arts” (2012). Shirane provides an interesting theory on how this myth was developed throughout Japanese history. In this post, we will look into the connection between nature and poetry. Those who know waka 和歌, Japanese poetry, will certainly agree that nature plays a central role in many poems. Haiku 俳句, for example, a still popular poetry genre of poetry nowadays, requires a seasonal word. 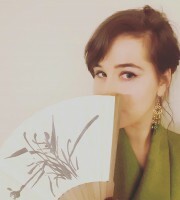 The connection between nature and poetry is very clear from the fact that “the imagery of Japanese poetry for more than a thousand years was drawn almost exclusively from the natural phenomena of the four seasons”. Hence, nature became a literary device through which human emotions were expressed. To illustrate this, I have tried to closely translate (with the same syllable structure) a tanka 短歌, or short poem, from the Collection of Ten Thousand Leaves (Man’yōshū万葉集), the oldest Japanese poetry anthology. This poem is actually part of a long poem (chōka 長歌) praising Yoshino in spring, a place close to Asuka, the capital at that time. 鳥之聲可聞 鳥の声かも the voices of singing birds. with their free and joyous songs. Shirane explains that Yoshino symbolized the current political order, but that later on, it would gain fame for its beautiful cherry blossoms and snow scenery. Thus, Yoshino became a place with a poetic essence (utamakura歌枕): only the name of “Yoshino” sufficed to evoke a seasonal association, i.e. spring. New for me was Shirane’s argument that the nature embedded in Japanese visual and material culture was not taken directly from primary nature, but was in fact a reference to poetry. In that sense, seasonal associations were originally developed by Japanese poetry and were only then passed onto other genres. As a result, classical paintings with a seasonal theme were not a direct reflection of nature, but rather inspired by the waka tradition that flourished among the urban nobility. Proof is the frequent combination of textual and visual elements, in which an image representing elements from nature or seasonal topics was further embellished by the well-chosen characters from a famous waka poem. From the few characters, a technique called scattered writing (chirashigaki 散書), one could guess what poem was depicted. Examples are clothing designs, paintings and screens, like the one below. During the Heian period (794-1185), poetry was limited to the nobility, and it is therefore somewhat ironic that the people who barely set foot out of their palaces, wrote thousands of poems about the nature they had isolated themselves from. Moreover, inside they were surrounded by seasonal elements and references to nature’s beauty. Since Heian aristocratic women rarely went out, screen and partition paintings, decorated with small sheets of waka, became, along with the garden, a surrogate for nature. The women often composed poems not on the actual small cuckoo that they heard in the garden, but on the hototogisu painted on a screen painting or partition. – Shirane (2012), 64. Shirane calls this “secondary nature” (nijiteki shizen 二次的自然), a culturally constructed nature that resembles in no way the real, raw nature. Hence, it should not come as a surprise that classical poetic motifs were strictly codified. A canon of nature images came into existence: all seasonal elements with their own established associations, set combinations and temporal and physical location. For example, April was represented by the lesser cuckoo (hototogisu ホトトギス) and Deutzia flower (unohana卯の花) in the canonized Poems on Flowers and Birds of the Twelve Months (1214) by Fujiwara no Teika (1162-1241). Plants, flowers and animals that did not make the waka shortlist were left unsung for centuries. For example, the only four-legged animal was the deer, associated with loneliness, since birds and insects were more fancied among high-class society. Another example is the fact that the most popular seasons to write about were spring and autumn, while in reality summer and winter are the dominant and lengthy seasons. This is perhaps linked to the idea that the Japanese finds identification with nature based on the transience that applies to both man and nature. In that sense, cherry blossoms and bright foliage are representative elements of “fleeting nature” in a “fleeting world”. When poetry diffused to the lower classes during the Edo period, the genre of haikai 俳諧, humorous poetry, gained popularity. Other, even vulgar topics such as cat love (neko-koi 猫恋), were introduced, along with a different perception of the seasons. As a result, new seasonal words were created, greatly varying from the traditional waka-based canon. The focus on nature, however, remained strong, and is still visible in the Japanese culture of today. Saito, Yuriko. “The Japanese Appreciation of Nature” in The British Journal of Aesthetics 25, no. 3 (1985): 239–51, p. 239. Asquith, Pamela J., Arne Kalland, Japan Anthropology Workshop, and Nordic Institute of Asian Studies, eds. Japanese Images of Nature: Cultural Perspectives [Seventh Meeting of the Japan Anthropology Workshop Held in April 1993 in Banff, Alberta]. Repr. Man and Nature in Asia 1. Richmond, Surrey: Curzon, 2004, p. 23. Miner, Earl Roy. An Introduction to Japanese Court Poetry. 1. publ. 1968. Stanford, Calif: Stanford Univ. Press, 1975, p. 68. Shirane, Haruo, ed. Traditional Japanese Literature: An Anthology, Beginnings to 1600. Translations from the Asian Classics. New York ;Chichester: Columbia University Press, 2008, p. 92-93. Shirane, Haruo (2012). Japan and the Culture of the Four Seasons: Nature, Literature, and the Arts. New York: Columbia University Press, p. 57. Saito, The Japanese Appreciation of Nature, p. 248.